See What’s In Store For ‘True Blood’ In July!!! 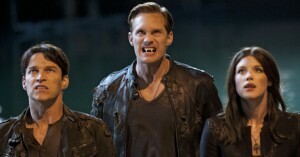 Eric (Alexander Skarsgård) and Bill (Stephen Moyer) have doubts they will survive the search for Russell (Denis O’Hare). Sookie (Anna Paquin) opens up to Alcide (Joe Manganiello). An irate Lafayette (Nelsan Ellis) unwittingly puts Sookie’s life in danger. At Authority headquarters, Roman (Christopher Meloni) and Salome (Valentina Cervi) continue interrogating Nora (Lucy Griffiths) about the Sanguinistas – and a possible traitor within the Council. Pam (Kristin Bauer van Straten) forcesTara (Rutina Wesley) to toe the line; Andy (Chris Bauer) and Jason (Ryan Kwanten) go to a burlesque party; Sam’s (Sam Trammell) shifter friends invite him for a run; Terry (Todd Lowe) flashes back to a deadly night in Iraq; Hoyt (Jim Parrack) tests the fangbanger waters; Sookie drowns her sorrows. Written by Alexander Woo; directed by Romeo Tirone. With time running short, Bill and Eric enlist Sookie to probe for clues on Russell’s hiding place. Unable to deal with the demon magic inside him, Lafayette calls out to Jesus’ spirit for help. Patrick Devins (Scott Foley) and Terry are held hostage in the bunker of their Iraq War buddy Brian Eller (Brian Geraghty). Jason wakes to a disturbing dream; Jessica (Deborah Ann Woll) gives Tara advice on adjusting to vampire life; Sam visits Luna (Janina Gavankar)with bad news. Written by Angela Robinson; directed by Michael Lehmann. The aftermath at the asylum leaves Sookie with an eerie sense of foreboding. At Fangtasia, Pam breaks up a vamp-girl fight, praising Tara for her tenacity. Lafayette visits Ruby Jean (Alfre Woodard), who also received a disturbing message from Jesus. Fearing for his family’s safety, Terry blames his curse for his troubles with Arlene (Carrie Preston). Alcide challenges J.D. (Louis Herthum); Sam offers to help Andy investigate the recent shootings; Roman lays out his plans to take out Russell. Written by Alan Ball; directed by Dan Attias. HBO’s ‘True Blood’ Kicks Off Its 5th Season On June 10th!!! Bryan Reviews HBO’s ‘True Blood’ Season 4 Bluray!!! 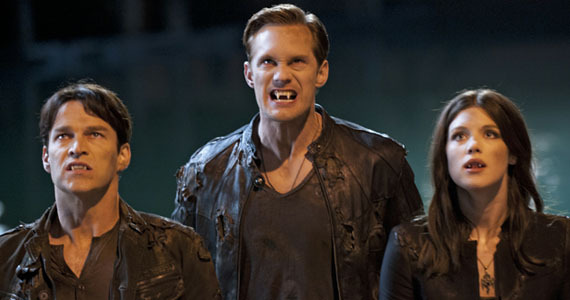 ‘True Blood’ Season 5 Premiering Tonight! Here’s What You Need To Know!!! Want to Find Out What’s In Store For The Last Two Episodes of HBO’s ‘True Blood’ Season 4??? This entry was posted on Friday, June 22nd, 2012 at 2:29 pm	and is filed under Film, News. You can follow any responses to this entry through the RSS 2.0 feed. You can skip to the end and leave a response. Pinging is currently not allowed. « Bryan Reviews ‘Seeking A Friend For The End of the World’!!! Danny was walking through the restaurant when he spotted me. Of all the gin joints in all the world.